Having burst onto the Russian art scene like a fireball, Troubetzkoy settled in the country instantly and effortlessly. The fellowship of the prominent Russian “Silver Age” artists accepted the newcomer as a native son. Troubetzkoy’s talent was immediately noticed, greatly appreciated and universally supported in Russia. The progressives from Russian artistic circles loved him dearly. His name and his artwork were featured in virtually every issue of the “World of Art” magazine. Thus it happened that until today it hasn’t really mattered to us whether or not he is a Russian artist at all, although his art is obviously an international asset. The son of a Russian prince and an American woman, Paolo (Pavel Petrovich) Troubetzkoy (1866-1938) was born, grew up, received education and started a career in art in Italy. 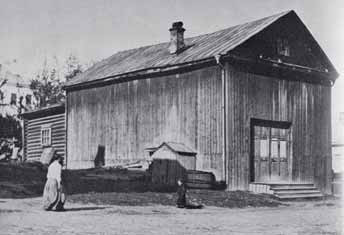 In Russia he worked, with intervals, from 1898 through 1906. By 1898 he already created a considerable number of works that can incontestably be called masterpieces, participated in many international exhibitions, and reached maturity as an artist. Twice, in 1906-1914 and in 1921-1932, he kept a studio in France, near Paris; from 1914 through 1921 he lived and worked in Hollywood, where he bought a small house and built a spacious studio. In 1932 Troubetzkoy returned to Italy, where he died in the small town of Pallanza near Lake Maggiore. In every place he lived, he felt at home and worked energetically. In fact, Troubetzkoy was one of those lucky artists who are born with an already formed individuality and a unique personality. Such figures have no definite roots in other artists’ work and “do not leave posterity in art” (to use Troubetzkoy’s own words). All they have to do is to be born at the right time. Fate arranged that Troubetzkoy was not only born at the right time, but also managed to materialize in Russia — first in Moscow, then in St. Petersburg — exactly when he was greatly needed. 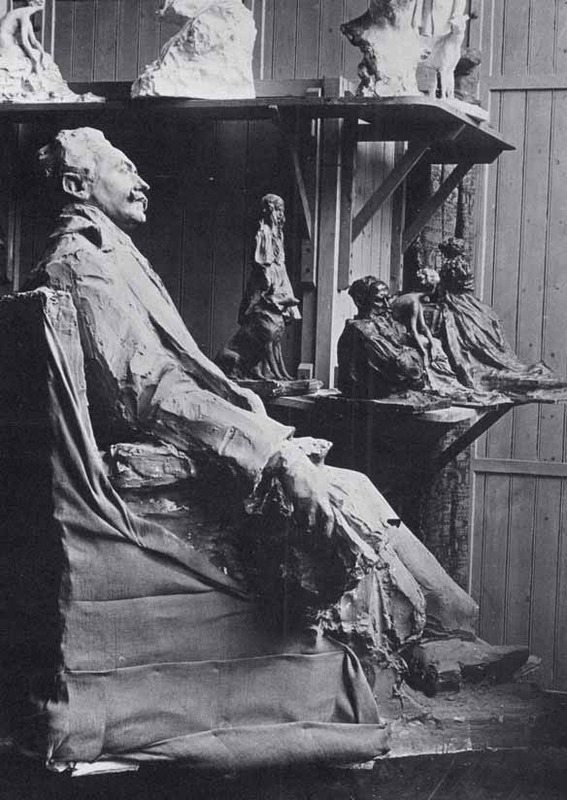 At a time when the academic sculptors completely ran out of steam, unable to join the collective endeavor of creating a new synthetic style, and exponents of the Moscow school of sculpture, already on the brink of achieving their goal to resuscitate sculpture, had not yet made themselves known. They seemed to be waiting for a lucky break. Paolo Troubetzkoy was to become such a “lucky break”. Huge success came to him in Russia, as well as the reputation of a pioneer and, to some extent, the leader of the new Moscow school of sculpture, although it was mostly other people who did the rough work of bringing it into existence. While it would be wrong to claim that Russia in any way influenced his art, it can be convincingly argued that it was Russia that created “the Troubetzkoy phenomenon”. 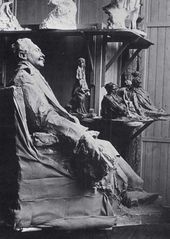 It is not clear whether Troubetzkoy felt pity or joy over the fact that in 1900, when he displayed his works at the Russian section at the World Fair in Paris and broke the ice, as Auguste Rodin put it, for the “Russian triumph” in the world, the world forever tied his name in with the Russian school of sculpture. 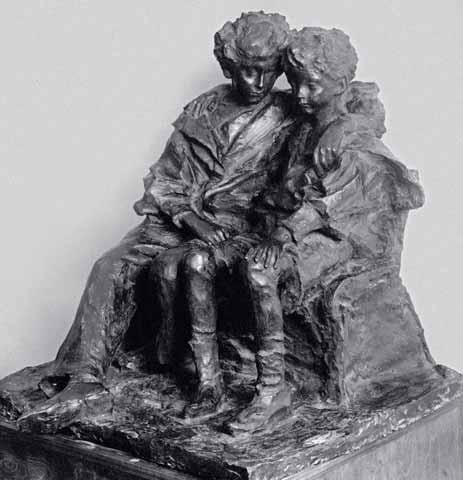 Troubetzkoy’s art has roots in northern Italy, in the artistic circles of Milan, which became, in the 1880s, the hotbed of sculptural Impressionism. 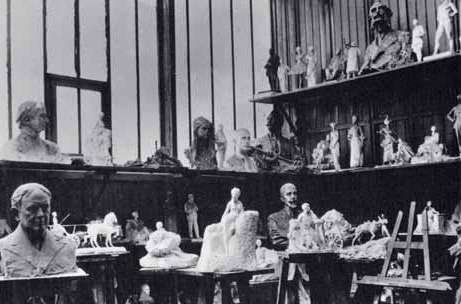 It was the Milanese sculptor Medardo Rosso (18581922) who first formulated the credo of the new trend and emphasized its goal of modeling “the visual image of an object”. Sculptural Impressionism was in many ways linked to “Verism” (from the Italian “la verita”), the trend dominating northern Italian painting, literature, sculpture and music in the 1870s-1880s; meanwhile, sculptural Impressionism ushered in an era of new sculptural thinking with its pivotal idea about the unity of the life of the object and the space around. Relieving sculptors from the obligation to look up to the traditional Classicist or Neo-Classicist canon, affirming the artist’s right to express his subjective ideas about life, fostering the cult of light and painterly surface, and keenly sensitive to all of its transformations, Impressionism in sculpture was laying the foundation of early 20th-century modeling. Troubetzkoy did not receive a regular art education, but he was from childhood familiar with the aesthetic principles of his contemporaries, and these principles turned out to have much in common with his talent. He very easily grasped the skills necessary for “bozzetto” — a sketch from nature, the technique used by his first tutor, a Verist sculptor Giuseppe Grandi (18431894); he was in many ways influenced by the art of Medardo Rosso, in particular, by Rosso’s alternation of smooth and broken strokes on the surface of the sculpture — the “basic elements”, and his painterly, “rough” modeling. 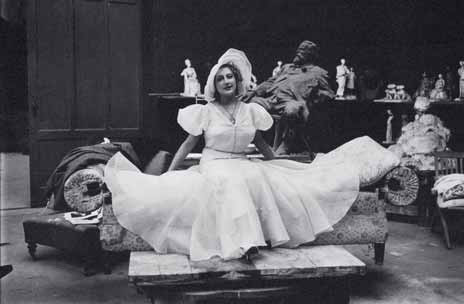 An artist by the grace of God, Troubetzkoy very quickly developed an idiosyncratic style of modeling and a personal sculptural “signature”, which none of his imitators — and there were some — could reproduce. Unlike Rosso, who aspired to “make himself forget about matter”, to dissolve matter in the air, Troubetzkoy always maintained a balance between the constructive basic elements of a sculpture and the space where they evolve. Thanks to this, he could produce both indoor statues and monumental sculptures. 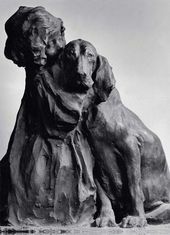 The surface of his sculptures, too, acquired an individuality: the “rough” strokes became more cultured, well organized, self-sufficiently elegant and beautiful. Troubetzkoy made the stroke a thing in itself. The luscious, emotional, and sometimes self-consciously showy modeling lent an outstanding beauty to the surface of his statues, made of soft, pliant materials. The diverse texture, sometimes absorbing, sometimes reflecting light intertwined the ethereal masses with air and light, continuously changing the appearance of the objects — this made the statues extremely life-like, and radically distinguished them from the anaemic and livid statues in the manner of Late Academism. That was what first stunned and enthralled the students of the Moscow School of Painting, Sculpture and Architecture, where Troubetzkoy was invited to teach sculpture and where, in the first year of his professorship, 40 people enrolled at his class. His arrival at the School was compared to “a blast of fresh air”. Good luck, and lucky chance indeed played a large part in Paolo Troubetzkoy’s life as an artist. But often “lucky chance” is something that takes an entire lifetime to bring about, and only a poorly informed person would think that Troubetzkoy’s personality had a bohemian character to it. In fact the artist was very industrious and self-disciplined, he spent all his life with a cutting tool in his hands. All of his life’s interests were built around his single main passion and, at the same time, profession — sculpture. Besides, Troubetzkoy was not a disinterested person on whom fame descended by itself. On the contrary, he did all he could to bring fortune to his side. Undoubtedly, the Russian cultural atmosphere of the late 19th-early 20th centunes — an environment that was very rich spiritually, imbued with emanations of the numerous brilliant, unique talents which so generously nourished literally every area of Russian culture — this atmosphere sustained and kept Troubetzkoy’s art on the crest of the wave. But there is equally little doubt that he managed to accurately capture the spirit and countenance of the age, and to become one of its best mouthpieces. Troubetzkoy’s working style itself, utterly new for Russia, was much respected and admired at the School as well. Apparently, the process of work was quite a fetching, engrossing “spectacle”. This “spectacle” enthralled the viewers and involved them into the sacrament of the creation of the artistic form. Eye-witness accounts that remain prove this. 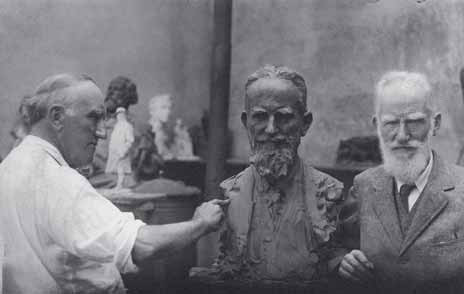 Even Leo Tolstoy, who every day came on a horse carriage to Troubetzkoy’s studio on Myasnitskaya Street, to pose for a portrait, and who made Troubetzkoy a Moscow celebrity, was genuinely surprised by the sculptor’s easy handling of the entire intricate set of implements — the basic instruments of every sculptor’s craft. This seeming ease made Tolstoy want to try his hand at sculpting himself. Obviously Troubetzkoy had around him a contagious atmosphere of creativity, with the “maestro”’s personality contributing to it just as much as his art. All who saw Troubetzkoy work — from sculptors just beginning such as Nikolai Andreev, Sergei Konenkov, and Vladimir Domogatsky, to a well established painter such as Valentin Serov — aspired to be a bit more carefree and unrestrained — “like Paolo”. Indeed, it seemed that around him there was nothing “non-plastic”, nothing that he would not be able to sculpturally reproduce. Unburdened by purely Russian problems, a visitor from a different world, Troubetzkoy created without restraint or inhibition. The new form, which preoccupied Muscovites so much then, was born in his hands as if by itself — like a spontaneous reflection of life. Elegant and aristocratic, this new form pushed to the sidelines the difficult issues such as construction, mass, weight, and systematic arrangement. All these things seemed to come naturally in Troubetzkoy’s works — in every piece they were organically linked to the character of the image, be it portraits, figurines or genre pieces. In his every piece the sculptor captured that “instant jolt” which epitomized the most essential, in Troubetzkoy’s opinion, characteristics of the situation or the sitter featured. The phrase “to model a la Troubetzkoy”, meaning modeling quickly, exuberantly, lively and cheerfully, became a catch-phrase among Moscow sculptors. And the type of artist exemplified by Paolo Troubetzkoy, in itself, was novel for them as well. A “tall”, “handsome” person with perfect manners and social ease, and at the same time — an uninhibited artist unshackled by society’s conventions, an Europeanized artist, he allowed himself to ignore all the opinion leaders of the art community, to indulge in hobbies and to show off the fact that “in order to keep his thinking and attitude to life completely independent, he has never read — and never reads — anything”. This innate self-esteem, independence, the natural demand that his art be respected secured for him a very special place at the School. 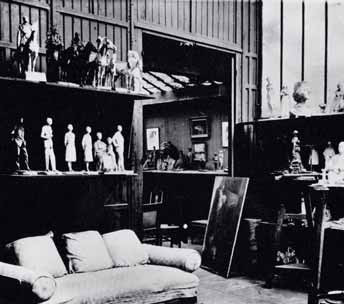 A separate studio was built for the sculptor — with a high ceiling, a skylight and doorways that were wide enough to let in “a carriage and pair, and Cossacks on horses”, as wrote Boris Pasternak in his memoir — he happened to witness all the goings-on in the studio (one of the windows in his father’s, Leonid Pasternak’s, apartment overlooked the studio). 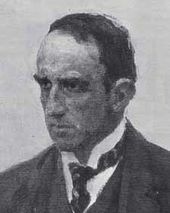 The School director Prince Alexei Lvov offered him another advantage, speedily building a bronze foundry and bringing from Italy an excellent founder Karl Robekki. From the Muscovites’ perspective, such a dedicated attitude to an artist’s needs was unprecedented. For all this, different groups of artists were divided in their opinion regarding Troubetzkoy. The Russian press lavished on him the most flattering praise and at the same time pummeled him with the most abrasive criticism. Today, it does not matter much whether the master was reviled or praised — the most essential point was that art critics started to debate the problems of sculpture as such, which for a long time were virtually ignored in Russia. The widely diverging views on Troubetzkoy’s art held by early 20th-century critics should no longer surprise us: the heated debate between the proponents of academic art and innovative art is now a matter of history, and history decided in favor of the innovative strand of art. Advocates of the old academic tradition called Troubetzkoy’s art decadent. According to Igor Grabar, “decadence” then was a term applied to everything that “did not conform to the classic tradition in literature, painting or sculpture”. Quite understandably, the sculptors educated at the Academy (Vladimir Beklemishev, Robert Bach, Matvei Chizhov, Alexander Opekushin, Mark Antokolsky, and Artemy Ober), were all eager to obtain a commission for a monument to Alexander III — and the statue was ultimately commissioned to Troubetzkoy because the widowed empress favoured him; these sculptors were unable to understand and appreciate Troubetzkoy’s innovative forms. Equipped with a basic academic literacy, the sculptors quite genuinely failed to notice these forms, believing as they did that the forms simply did not exist and Troubetzkoy’s ideas and inspiration, “just like water poured into air”, could not be grasped by the human mind. Indeed, the academicians believed Troubetzkoy was a “plebeian in art” who had neither knowledge of anatomy nor drawing skills. Troubetzkoy, not unreasonably from his perspective, called them “workman painters” incapable of creating freely and producing bad copies, “imitations”, “laboured profiles of exalted heroes” instead of real life. In the years Troubetzkoy spent in Russia, he experienced an artistic renaissance. In Russia he created some of his finest pieces such as “Mrs. Gagarina with a Child”, “Muscovite Cab Driver”, “Children. Troubetzkoy Princes”, “Mrs. 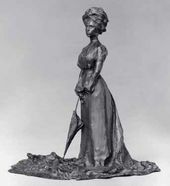 Botkina with an Umbrella”, “Dunechka”, “Isaac Levitan”, “Mr. Witte with a Setter”, “Portrait of Leo Tolstoy”, “Leo Tolstoy on a Horse”, and others. These statues, breathing the spirit of the age and perfectly attuned to it, gave, even to an unsophisticated viewer, a glimpse of “the world of delightful particulars and details of a life that is purely Russian” (Vasily Rozanov); they captivated, without any explanations attached, with their beauty and elegance. Troubetzkoy’s works attracted the artists’ imagination with their radically new sculptural conceptualization and language, and new method of achieving unity of form and content. For a period the young Russian sculptors were held totally in thrall by Troubetzkoy. The Russian critics would often impute to Troubetzkoy’s pieces meanings and messages that simply were not there. 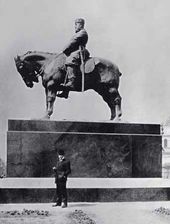 The best example of this is the reception of the statue of Alexander III, one of the masterpieces not only of Russian art but of the entire monumental art of the early 20th century. The monument was unveiled on Znamenskaya Square in St. Petersburg on May 23 1909. Troubetzkoy’s alleged pronouncement that working on the statue he purported to portray one animal on top of another gave rise to far-reaching conclusions. In line with the entrenched tradition to interpret sculptural works within a literary framework, more familiar to the public, critics for a long time tried to detect in the statue a profound message of fearless criticism, allegedly concealed therein. ambitious purpose for an artwork. And certainly this purpose is meatier and more meaningful than just voicing through a statue an idea that the Tsar is a petty tyrant, something which, by the way, he clearly was not. of Russia’s instability. Such was the truth of the new art. 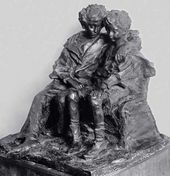 Initially, perhaps Ilya Repin alone properly understood and appreciated the purely artistic “politics” of the statue, the sculptor’s principled denial of all academic norms and underlying rules. The statue was able to influence the minds “with all of its artistically stirring bronze mass”; therefore, a beautiful, in the classic sense, silhouette or academic drawing and proportions were not called for. For Russia, that signified the coming of a new age in sculpture, a sea-change in the sculptural thinking which Troubetzkoy heralded with the carelessness of an enfant terrible. 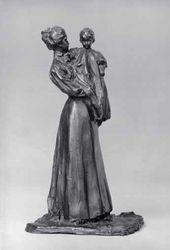 Troubetzkoy’s artistic credo, his sculptural vision of the world, was best explained in a talk with Leo Tolstoy, related by the latter’s secretary Valentine Bulgakov. 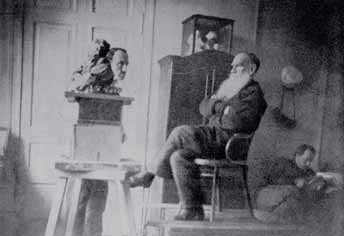 When Tolstoy asked the artist what was it that he liked about him (Tolstoy), given that Troubetzkoy did not read a single book by Tolstoy, the sculptor replied: “You have a wonderfully sculpted head”. That was the essence of his artistic approach. His modeling was guided by his vision and sense of form; he foresaw the evolution of form in space and represented that in its uniquely characteristic motion. In some sense, Troubetzkoy’s constructions are an emulation of nature, with the form growing from inside, gaining strength and finally opening up. Troubetzkoy used to say that he loved life “that is not dried out by academics’ speculations”. Like the Impressionist artists, he loved the singleness and uniqueness of the essence of that which he aspired to image. And since he was a sculptor, he was focused, before all, on the plastic richness of the world around. The young Russian sculptors first came to know sculptural Impressionism through Troubetzkoy’s works. Troubetskoy was first of all a master of indoor sculpture, skilled at charming and always distinctly idiosyncratic “portrait-statuettes”. The young Muscovite sculptors liked so much the fetchingly beautiful painterly surface of the statuettes that initially many of them believed that the essence of the new form consisted in the distinct treatment of the surface. However, this treatment was only a corollary and an instrument in the principally novel system of image construction. 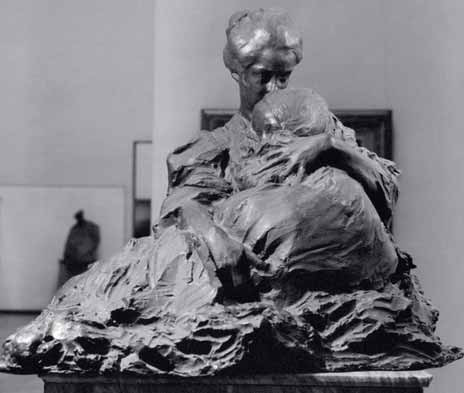 The main achievement of Impressionism was integrating space into the very texture of sculpture. There remained just one step to be made to incorporate space into the sculpted object. who philosophically reflected on Impressionism as a phenomenon, called “decomposition of continuity”. An important feature of this form is that “when presented only through its characteristic points, it stronger stirs up the imagination and creative mind of the beholder” (Vladimir Domogatsky). Or, relying on the innate “knowledge” that the human eye possesses, the eye’s tendency to spontaneously resent the absence (or deformation) of a proper form in its proper place, the artist could expect from the viewer a reciprocal, and very lively, creative spark, which would reinstate the natural form in the viewer’s imagination. Rodin’s discovery of the method of enhancing form and emphasizing its characteristics had a limitless potential, and Rodin himself, very soon after the discovery, took the form to new heights. 1900, the year when sculptural Impressionism won worldwide recognition at the World Fair in Paris, was its single high — and its highest — point. The lifespan of sculptural Impressionism was just one third of the lifespan of Impressionism in painting, because sculptors picked up the trend much later while realizing its potential nearly instantaneously. 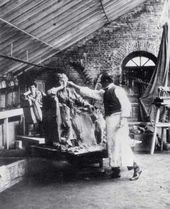 Rodin in his later period, Aristide Maillol, Antoine Bourdelle, Joseph Bernard developed and elaborated the Impressionist form; they were succeeded by exponents of different leftist movements — Alexander Archipenko, Osip Zadkine, Jacques Lipchitz, Henry Moore and many other avant-garde artists. Although the effects these masters used — for instance, convexities and depressions in places opposite to those where they should be in real-life objects, or gaping holes within sculpted objects — are no longer Impressionist, they originate from the same pivotal premise of Impressionism. Objects whose forms were modeled by the artist’s mind were becoming ubiquitous. Occasionally, an artist would come up with a simple sculptural simulation of real life, and then again the flight of fancy, the inventing, and the contriving would resume. Russia did not instantly grasp the gigantic sea-change brought about by Rodin in sculptural language. However, beginning already from the 1910s graduates of the sculpture department of the Moscow School of Painting and Sculpture set to interpret Post-Impressionist ideas and concepts. Paolo Trubetzkoy’s pointed, idiosyncratic style alone no longer sufficed for them. Many even complained that the flamboyance of his art, unusual for Russia, for a while seduced the Muscovites away from the main course that sculptors across the world were exploring. One of Trubetzkoy’s most loyal admirers, Alexander Matveev, literally destroyed his Impressionist pieces. As it turned out, Troubetzkoy’s shortcomings were the continuation of the principles he so proudly preached: to study nothing, to take a leaf out of nobody’s book, to ignore opinion leaders, whether Dante or Tolstoy, the great Greeks or the impactful Rodin. In the age of stormy and precipitous changes in art, when he happened to live and work, he proved himself much more immune to external influences, including artistic ones, than others around him. Spontaneity and the originality of his gift accomplished everything for him, while he chose not to develop his talent or to study. The form he created did not become stronger over the years. It is not by chance that we are talking about Troubetzkoy’s art in general — it is indeed quite uniform, although the individual pieces certainly differ in terms of degree of perfection. Troubetzkoy’s art proved to be an art of the present, and while the present was new, the art seemed innovative. But as soon as he wanted to receive dividends from his pioneering work, he started to slide down irrevocably into salon art. Gradually Troubetzkoy was developing a fairly neutral style, becoming the portraitist of choice of the international aristocracy and different celebrities. In 1906, when he displayed his works at the Salon in Paris, the critical response was still quite favorable. 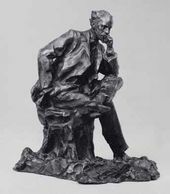 He was reviewed by such critics as Achille Segard, Arsene Alexandre, Salomon Reinach and such poets as Tristan Klingsor and Robert de Montesquieu; Rodin wrote favorably about him. But all these reviewers regarded him as an exponent of the Russian school, which, as yet, was little known in the West. Troubetzkoy’s era was winding down fast. Impressionism was becoming nothing more than a stepping stone to start with and then to walk on from. At that time artistic ideas were changing nearly daily, and the form that lived off the present day alone tended to instantly become outmoded. In Russia many even believed that Troubetzkoy died sometime soon after 1914, when he left for America and stopped exhibiting at Russian and European shows. In fact he did not die before 1938, working literally until the very last day. His was the case of an artist outliving his art. To a large degree, Russians found Troubetzkoy alluring and special due to the fact that barely had his works been flashed through the Russian exhibitions, the artist disappeared from our cultural horizon, as quickly as he came into sight, — too fast to provoke an irremediable irritation over the “inordinately light-minded and superficial tone” (as stated by Alexander Benois) of his works. The times in Russia were changing fast, and fast was the turnaround of various harrowing problems, which Troubetzkoy eluded as a very beautiful and carefree bird shedding in its flight a couple of its marvelous feathers — a rare piece of luck in the life of those artists who have the fortune and the misfortune of being able to express themselves fully. 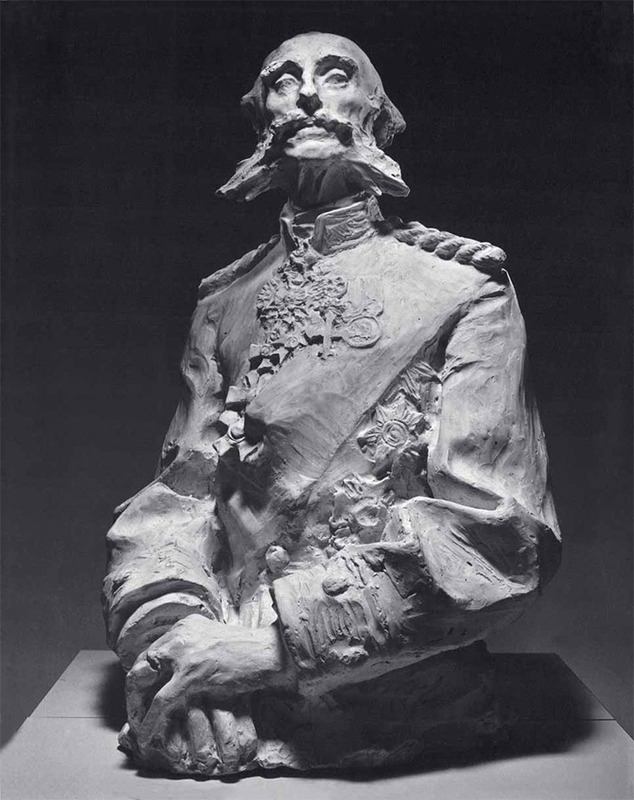 In Russia at the turn of the centuries, Paolo Troubetzkoy became a cultural landmark. Strange as it may seem, it was his carefree attitude that helped finally reveal the impotence of the outdated academic forms and relieve the artists from the obligation to heed this canon such as it had become by the late 19th century. This alone is sufficient to love Troubetzkoy “with a special love”.